Last week or possibly the week before, I got some messages from a guy named Matt Taylor wanting to know if I was interested in some Wave 5 and beyond ship prediction-type articles. Always one for free content, I said of course. We mailed back and forth a bit, then today I received this gem regarding the YT-2400 in my inbox. Matty has put some really solid work into this article and I'm absolutely stoked to share it with y'all. If you dig it, let a brotha know and maybe we can talk Matt into cooking up some more articles like this as I'm just not familiar enough with the Extended Universe stuff to really make these kinds of calls. No disrespect to Master Yoda, but with Star Wars X-Wing, it's been pretty easy to predict the way FFG's releases would go. Aside from the HWK-290, which I don't think many people saw coming, the waves have followed the original trilogy movies until Wave 4, where Fantasy Flight dove full-on into the EU pool. Reason being, there just isn't much pure G-Canon (George Lucas Canon) material left from the Galactic Civil War period. Let me Koiogran turn for a second here. My name is Matt Taylor (Twitter: @dak_ralter), and besides being an avid X-Wing fan, I'm also a Star Wars nut. I've played the games, read most the books, and my dog's name is Chewbacca. Because of this, I'm always thinking of new ships, pilots, actions and other upgrades for X-Wing and how they would fly in the context of the game's mechanics. Clint has graciously allowed me a spot on TMB for my musings, where I'll be trying to predict the next waves of X-Wing miniatures. (I like using the tactile stuff first before I turn to the internet, because... I don't know it just makes me happy and nostalgic). Granted, by no means am I the end-all-be-all authority of this. The point of these articles is to spur discussion, and my suggestions are just that - suggestions. I'm shooting from the hip (under the table, and FIRST), and would love nothing more than tons of comments and feedback. In addition, I read a good amount about this game and have seen mock ups of many of the ships I'll be discussing, therefore I'm not always breaking new ground. If I do remember that I saw something specific somewhere, I'll always give the l/t (lightsaber tap) to the source and link them. So, with all that being said, the first ship I'm going to tackle is one of my favorites, and one that I am almost positive will be announced soon: CEC's YT-2400 light freighter. You may say that my overconfidence is my weakness, and it may well be. However, I think Fantasy Flight may have inadvertently tipped their Sabacc hand during their reveal of the TIE/D Defender. 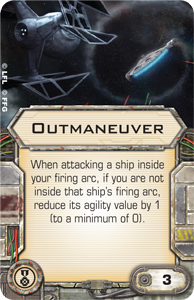 On the card "Outmaneuer" a TIE/D is trading volleys with a motion blur obscured ship in the distance. On first glance it appears as if it's a CEC YT-1300, but upon closer inspection the number and size of the vent plates (3 large) and the position of the cockpit, it's evident that this isn't the iconic YT-1300 freighter, it's actually a YT-2400. Both the YT-1300 and the YT-2400 were designed and produced by the Corellian Engineering Corporation, one of the galaxy's largest ship manufactures. Their ships, and specifically the YT series, were known for their ability to be customized by smugglers and mercenaries for more... nefarious uses. As you're well aware, Lando Calrissian and later, Han Solo and Chewbacca, souped up a YT-1300 into the famous Millennium Falcon, which Fantasy Flight released in Wave 2. There was a famous retrofit of the YT-2400 as well, and you'd likely know it by it's name, the Outrider. 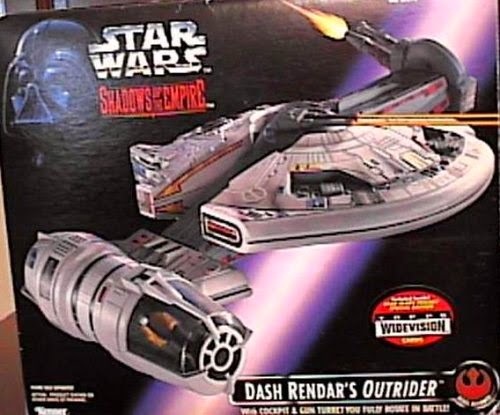 The Outrider was a heavily modified YT-2400 flown by Dash Rendar, a Correllian smuggler and soldier of fortune who's story was told in the Shadows of the Empire novel and storyline. Shadows takes place in the time frame between The Empire Strikes Back and Return of the Jedi. In one of the main story lines, Rendar, (who also flew against the Imperial assault at the Battle of Hoth) assisted Calrissian and Luke Skywalker in rescuing Leia Organa (who apparently can only be rescued a team consisting of her brother and a random Corellian scoundrel). Dash became a popular character due to his wit and cunning... he's basically a Han Solo clone in a Han Solo clone ship. He was so popular, though, that George Lucas actually added the Outrider to a flyby shot of the Mos Eisley spaceport. This made the Outrider G-Canon, and to my knowledge, it's the only G-Canon ship within X-Wing's currently established scale not present in the game. So, you know it's coming. On to the ship itself. As its model series and design suggest, it's very similar to the YT-1300. It's a newer model, though, and therefore it could be argued that an unmodified version would be faster and more maneuverable than its older stock counterpart. 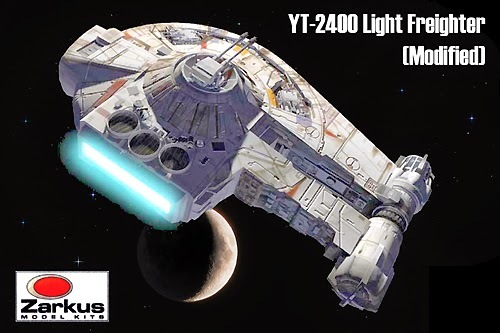 The YT-2400 also had 1D servo turret laser cannons mounted ventrally and dorsally, which took advantage of the ship's shape to achieve a 360 degree lateral firing arc and a 180 degree vertical firing arc. The YT-2400 also featured two front facing concussion missile tubes with magazines of 3 each. I'm having a hard time thinking that FFG is going to release a ship with the same capabilities and talents as the YT-1300. It just wouldn't make sense to have a ship doing exactly the same thing, but looking slightly different. Each ship has brought something a little bit unique to the tabletop, and I doubt the YT-2400 will be an exception. The following are just my ideas, and I'm definitely up for your feedback and discussion! Reason for the differences is that the 360 firing arc with 3 die is too strong to stick on a cheap pilot, else you would see a lot of triple "Outer Rim Smuggler" builds mowing through tournaments. They also scaled the hull and shield back to prevent the annoyance of that type of build. Now, a big question would be the firing arc. I can't say that I thought of this alone, as many of the mock YT-2400's I've seen have had an 180 firing arc, and I agree that approach may be the way to go. Unfortunately this doesn't directly line up with canon, but if you give it a 360 arc, it's too close to the YT-1300 to justify it's inclusion in the game. To give it extra pop, maybe the entire front arc is primary, meaning you can hit ships to the side with your missiles? I don't know if that's feasible… but, speaking of which, let's head to the upgrade bar. First and foremost, I think it's a must to add the turret upgrade to this ship. It's a compromise, you get the 360 functionality that this ship is known for, but it comes at the cost of a few points and the loss of the range one bonus. I think that's a decently fair trade off. To further differentiate from the YT-1300, I think it only gets one crew member slot. I'd assume that both Dash Rendar and Leebo would be available as crew members as well as pilots. I also think that this ship could be the first Rebel ship with two missile slots. It lines up with the canon, and it gives the YT-2400 a unique edge. Lastly, as I'm sure you assumed, I'd give Leebo and Dash the EPT slot, but not the Freelance Spacer. You have your Focus and Target Lock, no question and no real explanation needed. The additional action I'd suggest is Evade, as it gives the ship that extra differentiator over the YT-1300. I do also think that, like the Falcon and the Slave I cards, the Outrider should have it's own title card as well. Perhaps a two point card that adds boost to the action bar? Thoughts on this? 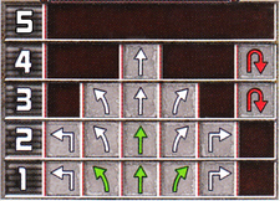 Mobile in close with a range of low speed options, but limited by only a handful of green maneuvers. 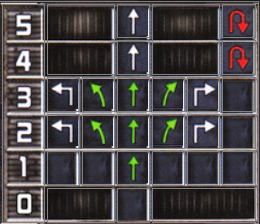 If we're going with the fact that the YT-2400 was faster and perhaps a bit more nimble, here's the grid I came up with. I gave it a bit more green, and took away some of the one speed maneuvers. I went back and forth on this a lot, though, so I'm willing to take some suggestions! So, that's that. 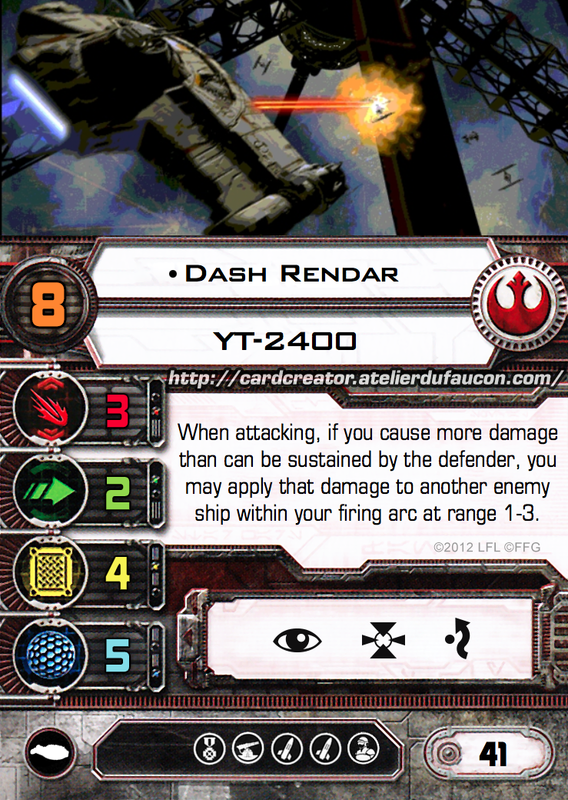 Here's my idea for Dash, with a unique pilot talent that covers uncharted territory for the X-Wing game. I'm sure you understand what I'm trying to do here. Say you are up against a TIE with one hull left at range 2. They choose the evade action, and roll their 3 green dice and come up empty. You roll three hits, and inflict two damage. The TIE only has one hull left, so you have that leftover damage that would usually vanish into nothing. With Dash's talent, you that damage would be transferred to another ship within your arc. It's not a great early game talent, but it could really clean up later on. So whaddaya think, y'all? Good stuff, no? I think Matty's definitely on the right track here and I totally missed the YT-2400 in the Outmaneuver card until he mentioned it in the comments last week.